Hardwood floors are a popular flooring choice for many. These floors provide depth, texture, and a natural feel that is unrivaled from other flooring materials. Wood flooring is not exempt from getting dirty, unfortunately. Dust, dirt, pet dander, and spills can all take their toll. Surfaces such as carpet can best hide some of these issues, but with hardwood flooring, it’s all in plain view. While cleaning your floors frequently ensures a sparkling clean surface for your home, it can also help with the upkeep of your flooring, extending its life in between refinishes. With that said, here are some tips for ways to effectively clean your hardwood floors. Before delving into the various methods and situations, it’s helpful to first state what should be avoided when cleaning these floors. Nearly all modern hardwood floors are coated with either acrylic, urethane, or polyurethane coatings. Because of this, waxes, oils, and furniture sprays should all be avoided. First of all, they aren’t needed when these coatings are present. Secondly, they can turn your home into a skating rink, as the oils will “float” on top of the coating instead of penetrating it. Alkaline, ammonia, and other abrasive cleaners should be avoided a well. 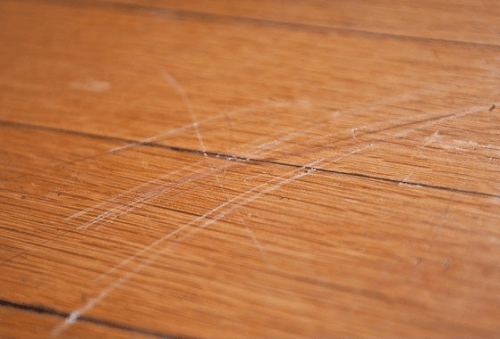 These cleaners are much too harsh for wood floors, and can actually scratch the finish. Areas in your home that have high traffic should be swept at least every other day. If you have pets, daily sweeping will most likely be in order, as this ensures that your floor is free of hair and dander. If left unchecked, pet hair can be sucked into your vents, and accumulate in corners and under baseboards. 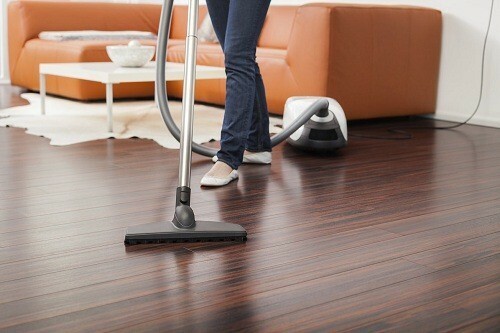 Brooms are effective enough for wood floors, but using a vacuum can be even more effective. The best vacuum for hardwood floors are models that can get low to the surface, and also feature detachments that allow for easy cleaning in corners and around baseboards. Mopping should be done at least once a week in heavily trafficked areas, and one or two times a month in other parts of your home. For mopping, a chamois-style mop is recommended. What to Use to Clean Hardwood Floors? The best way to clean hardwood floors is just to keep things simple. To mop, fill a bucket with a mixture of warm water and mild cleaning solution, wring it out as much as you can, and mop in the direction of the wood grain, rinsing your mop often. If your mop bucket becomes murky, simply empty the contents and refill with water and cleaning solution again. Once you’ve used the soap throughout the area, go back over it with a clean mop to get all the soap off the floor. It’s crucial to make sure you are not using too much water. 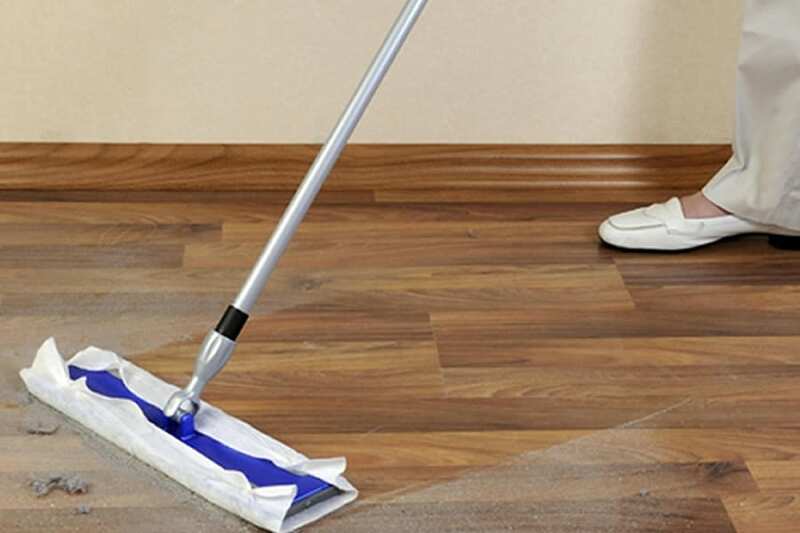 Although your floors are sealed, they can still warp from exposure to excessive amounts of water. Wood floors are prone to minor scuffs and scratches over time, which can diminish the look of the floor, making it look old, damaged, and dull. To minimize the effects of scuff marks, shake a small amount of baking soda on a small, damp sponge, and rub it into the scuff marks. Cracks are a whole different issue, and are best left alone. You may even notice more cracks in your wood during the winter time. Dry heat from your heating system can cause the boards to shrink and reveal cracks. Summertime and humidity causes the boards to expand, which minimizes the look of the cracks. Although not required, a humidifier can help in this situation year round. While sweeping and mopping is very effective, they aren’t always guaranteed to get out all of the bacteria from the flooring, especially in between boards. Because of this, many opt to steam clean their hardwood floors. While this can be effective, it should be done with extreme caution, or by a professional with the right equipment. 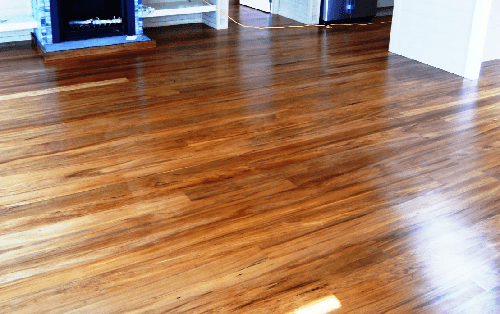 Although most homes have modern coatings on their wood floors, older coatings such as varnish, lacquer, shellac, and oil-treated floors still exist. If you aren’t sure whether your floor has a modern coating or not, simply rub your finger along a board. If it leaves a smudge, you’ve got an older coating. Since older finishes aren’t waterproof, damp mops are discouraged. Instead, simply sweep or vacuum the floor, and apply fresh wax when needed. Old wax build-up can be removed using stripper made from mineral spirits. Once the wax is removed, a paste wax or liquid wax can be used to reapply the coating. Once the new coating is dry, apply one more. Be sure to avoid water-based waxes and furniture waxes. The new wax coating can then be buffed by hand, or with a buffing machine. As far as stains go, use a small amount of dishwashing liquid to break up oil-based stains. Other marks and stains can be removed by using No. 000 steel wool and floor waxes. Messes on your flooring can be minimized by following a few easy steps. Placing entryway mats on the outside and inside of your doorways gives you and your fellow house inhabitants a way to clean shoes off before coming inside. If that’s not enough, remove your shoes by the doorway. Clean up and liquid spills immediately, as they can warp the wood if left to sit. If you have pets, try to clean your floors once a day to prevent buildup that can be tracked throughout the home and into cracks. Placing felt pads under chairs and using area rugs in play areas and high-traffic areas will reduce wear and tear and messes as well. If you have a larger home, or simply lack the time and effort to clean your hardwood floors, you can elect to hire a hardwood flooring cleaning service for both. 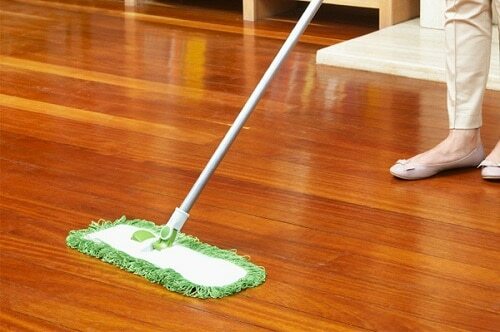 Thank you for the 10 useful tips for cleaning hardwood floors. I like the idea to also perform or have methods of preventative maintenance and cleaning. Like using mats in heavily trafficked areas to prevent dirt and scuffs. It’s also good to note that you should make sure if you are cleaning your floor with a mop to clean the bucket and mop regularly to prevent scratching the wood with dirt particles the mop has collected. My house flooring is having too much scuff marks, I tried your given tips but still, it looks bad. As they are much deeper. As of right now, I can’t afford new flooring. Can you suggest me any other tips to recover it?? ?